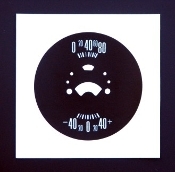 Vinyl decal made to restore your faded original 1968-70 oil-amp gauge. To apply decal you will need to remove the front retaining ring and remove the gauge form the housing. Remove the two screws on the plastic legend trim. Remove the two screws holding the oil pressure gauge and remove gauge off of the face plate. The decal is made to go on the face plate with amp gauge attach. If the gauge face is corrode or has paint flaking off, it will need to be sanded smooth. You can prime and paint the face with flat black spray paint of you choice. Apply the decal wet with water and a very small amount of dish soap in a spray bottle. Position decal and smooth out using a soft cloth and let dry for 15 minutes. After 15 minutes has past, smooth down the edges with the soft cloth. The decal does not go all the way to the edge because of the concave face. Let dry overnight before assembling back together. For the best results, repainting the needles is recommend. Spray a very light coat of fluorescent orange on the needles. For 1968-70 AMC AMX / Javelin models with Rally-Pac gauges.